During this project, we started by asking questions about driving. Popular questions were things like: What is the fastest route to school? My question was: How much faster will I get to school when going 10 mph over the speed limit? It took me a little while to come up with this question. At first, my question was: What is the fastest route to school? I realized that I already knew the answer to this question because I was curious about this earlier this year. I also knew that I could answer this question in about three days, and I wanted to challenge myself. In my question, I didn't test this out because I didn't want to get pulled over. I also didn't calculate my route to school with traffic. Once I knew my question, I started by adding "stops" whenever the speed limit changed. 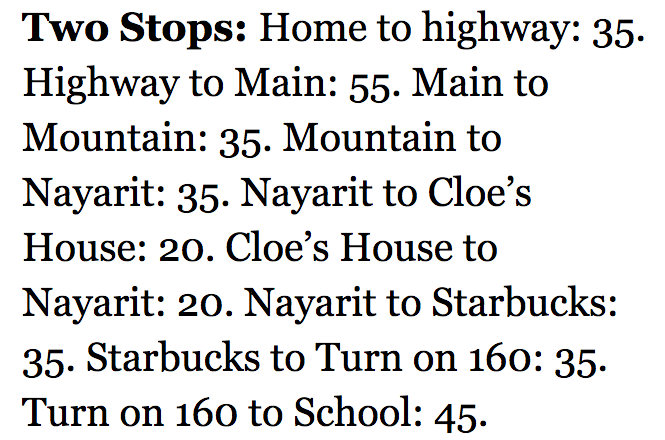 Then I added one of my stops and lastly, both of the stops I usually make on the way to school. Next, I used Google Maps to calculate the distance in between "stops. "​ Then I used the formula Distance/MPH=Time. I plugged in the numbers for each stop. Finally, I added all of the numbers together for going the speed limit and going 10 MPH over the speed limit. I discovered that when going the speed limit, it takes 14.39 minutes to get to school. When going 10 MPH over the speed limit, it takes 11.6 minutes. This means that it is 4.79 minutes faster when going over the speed limit.